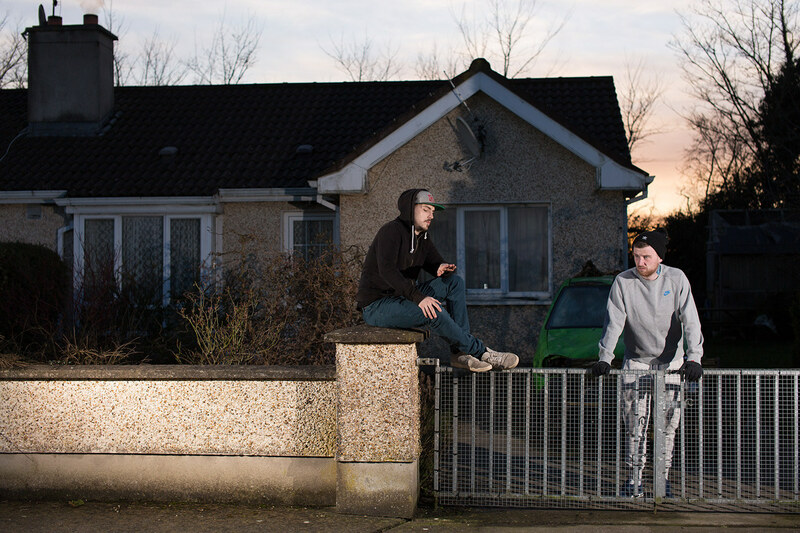 Loitering is a series of constructed photographs which represent the everyday lives of young people living in an average rural town in Ireland, the images attempt to capture the spirit of the ‘Lost Generation’. In rural areas young people are often faced with limited opportunities, many are forced to move to the city in search of work. For those who stay the importance of finding a tribe is essential. In contrast to the city, youth culture in rural Ireland is about self-reliance and innovation; an ability to adapt to an environment that must be shaped by its inabitants. In one of the images, a farm building is upcycled and used as a private club. Boredom can often lead to problems such as alcohol and substance abuse. Searching for privacy in small town is also a challenge, in another image from the series a disused railway line leads to a safe place for drinking cans, an escape from the conformity of home. While those lucky enough to have access to a car spend their days listening to music and loitering around town. Highly commended at Inspirational arts awards 2018.